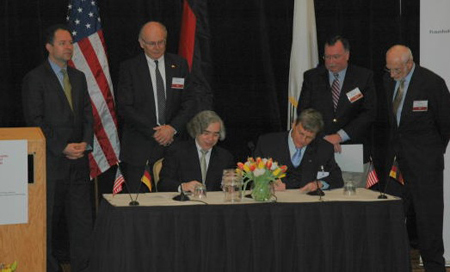 This weekend at the MIT Energy Conference, MIT and Germany’s Fraunhofer Institute said they would create the MIT-Fraunhofer Institute for Sustainable Energy Systems to do research in renewable energy technology. Once an area like Massachusetts gets established as a hub of cleantech innovation, it becomes that much easier to attract important partnerships. The center will be right next to the MIT campus and will first focus on research in solar, green buildings and prototyping energy hardware. The center will be backed by $5 million from MIT and $1 million from local utility National Grid. Fraunhofer is a huge research institute with 40 different centers in Germany, including the Fraunhofer Institute for Solar Energy Systems and a U.S. subsidiary. Between MIT and Boston’s tech community, Massachusetts is becoming home to a growing number of cleantech startups, including GreatPoint Energy, Mascoma, and GreenFuel. This weekend’s MIT Energy Conference hosted a long list of speakers that included Duke Energy’s CEO, James Rogers, and Kleiner Perkins greentech VC John Doerr.